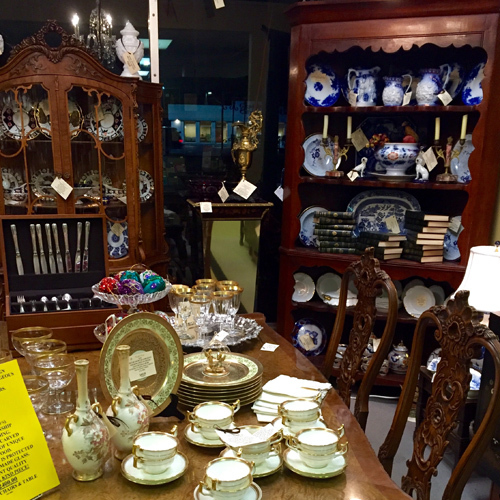 Nancy and Gene Ohlms offer mid-priced English and American furniture, porcelain, china (e.g. Coalport, Minton, Imari), antique & vintage oil paintings, lamps, as well as other decorative items from the late 1700’s and dating to the modern era. Gene and Nancy are a husband & wife team as antiques dealers as well as in their approach to life. The first year of their marriage Nancy set out to decorate their new home, but was surprised to find that the new furniture offered in retail stores was unaffordable. So even though she and Gene had never been to an auction or antiques shop, they decided to try it. What they found was a lot of beautiful furniture and smalls of better quality than the new stuff, and with an attractive price too! Nancy and Gene were hooked on antiques. Gene brings to the team his natural attention to detail, which ensures every piece of merchandise has had any necessary repairs, is clean, and ready for customers’ homes. The philosophy of their business, called Graceful Living, is to add charm and grace to the homes of their customers by offering unique, antique pieces.